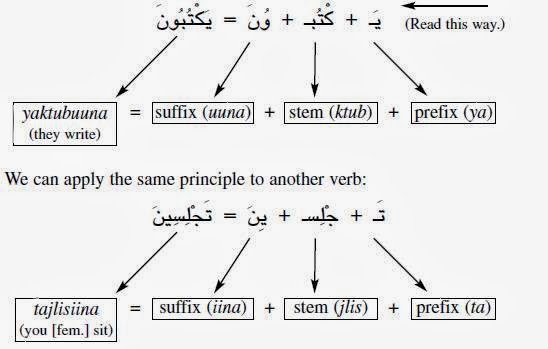 Verb and Tenses in Arabic | Hannay Gamal '+g+"
person masculine singular) becomes the base, or stem of the past tense. * For an explanation of masculine and feminine genders, see page 107. ** An extra ’alif (G) is written after the waaw (ƒ) but is silent. Note that you will not meet or need the feminine plurals as often as the masculine plurals. This is because you only use the feminine plural if all the people in a group are female. If the group is mixed male and female, the masculine is used. Therefore, this form is the most important to learn and become familiar with in the first place. There are also different endings for two people (the dual). To make it easier to absorb the basics first, an explanation of the dual and its associated verb endings has been separated. Notice that in written Arabic the subject (Fatma) usually comes after the verb (wrote). third column. Can you identify the stem that appears throughout? * The final ending (u) on some of the verbs above has been put in parentheses because it is not usually pronounced. 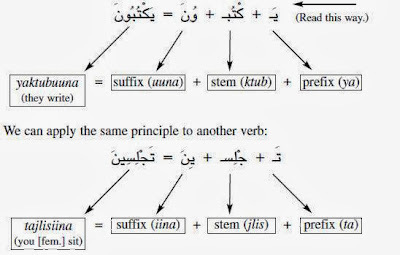 If you look at the table, you can see that the present stem — which appears in all the examples — is كْتٌبْ` (ktub): the three root letters k/t/b, with no vowel after the first letter and a Damma ( ُ ) after the second. Your friend is sitting in my chair! يَجْلِسُ صَدِيْقُكَ فِيْ مَقْعَدِيْ! Remember that in most cases the middle vowel will not affect the meaning of the text or your understanding of it. 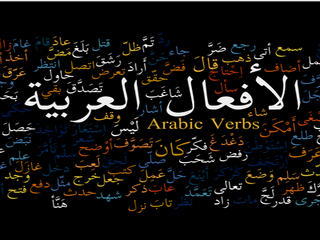 Most Arabic is written without vowels and you will probably learn the more common middle vowels over time. Don’t worry too much about this aspect. Native speakers will usually understand you as long as the root letters and the patterns are correct. If you want to talk about the future in Arabic, you also use the present tense. Often the word (sawfa) or the prefix (sa) are added to the front of the verb to indicate the future. We are going to the Egyptian museum tomorrow. The farmer will plant potatoes in the Fall. to show the subject of the verb. • The present stem is formed from the three root letters with a vowel after the second (ktub/shrab/jlis). Prefixes, and sometimes also endings, are added to the stem to show the subject of the verb.